My wife enjoys honey beers. Brewing beers my wife enjoys helps justify my brewing endeavors. 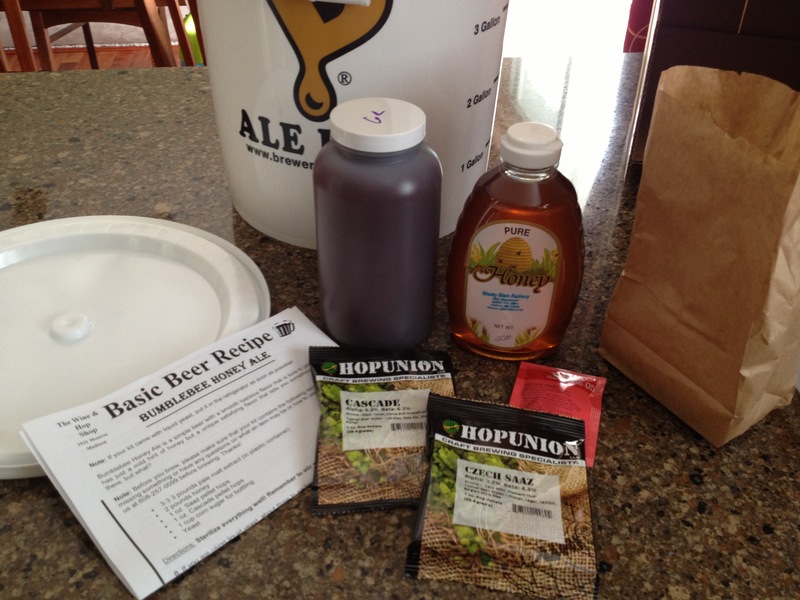 It’s almost summer and a honey ale would be refreshing on a hot afternoon. I bought the kit and a couple other things to help with the hydrometer reading and I was ready to brew! Two pounds on honey in this kit! So on Saturday afternoon while the kids were napping and when I should have been mowing the lawn I brewed instead! This beer has a 45 minute boiling time. The 1 oz. of Cascade hops get added at the start. Then after 35 minutes a half ounce of the Czech Saaz hops are added. And finally after 45 minutes the rest of the Czech Saaz hops and the two pounds of honey are added. Before I brewed my first batch I was incredibly nervous. Everything seemed so complicated, so detail oriented, and seemingly required perfection. This time around I just got to it. One of the lessons I learned the first time around is how to better control the heat from the turkey fryer. During the first batch it kept foaming up. This time I was able to recognize when that would happen and I turned down the heat to avoid that. Overall this second brew went very well. I was able to refine my process and speed things up. I didn’t make as many mistakes. And I had a lot more fun. It’s already bubbling like crazy, which is a joy to watch. Seriously, I could sit in my basement and watch bubbles move through the fermentation lock for an unhealthy amount of time. I even took a video of the bubbles. So the beer is fermenting nicely in the plastic Ale Pail. Next weekend I’ll switch it over to the glass carboy. I’m hoping to have this beer bottled and ready to go by the end of June. I may even bring some to GenCon in August (unless I drink it all by then)! The only question is what I should name it. I am naming all of my beers after Renaissance men since I consider myself to be a mediocre one. My first beer I named after Leon Battista Alberti. I’m thinking I might go with something like “Ben Franklin’s Honey” for this one. I hope it turns out to be delicious, no matter what I name it! 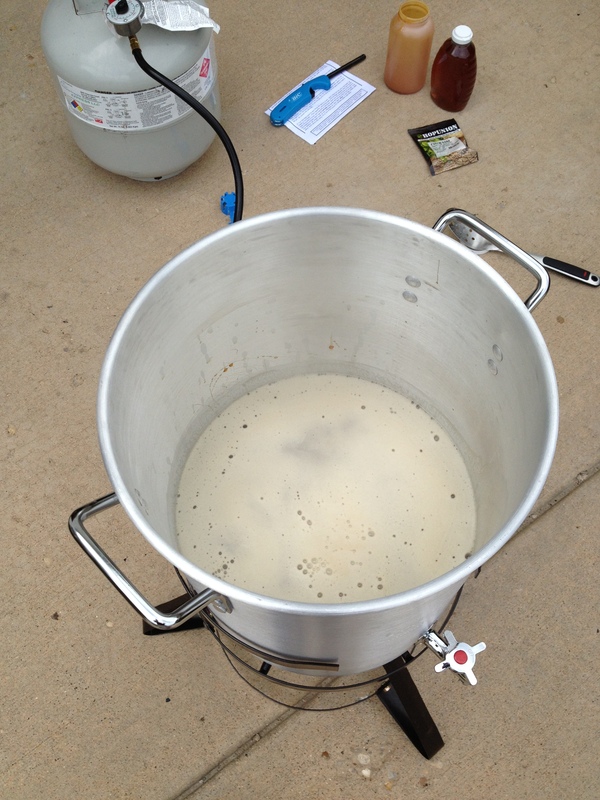 Posted on May 20, 2013, in Homebrewing, The Barley and tagged beer, brewing, brewing beers, carboy, home brewing, homebrew, honey ale, hops, wort. Bookmark the permalink. 1 Comment. What about naming your beer after Sir Edmund Hillary, a beekeeper who climbed to the top of the planet. or Gregor Mendel, a Monk, the father of genetics, astronomer, and yes…Beekeeper. Other Options are Charles Henry Turner, Leo Tolstoy, or the fictional Sherlock Holmes.